DETROIT -- Ford Motor Co.'s European operations reported a pre-tax operating profit of $107 million, compared with a loss of $585 million a year ago. Overall, the U.S. automaker posted net income of $2.1 billion in the first quarter, almost twice the figure projected by analysts. The increase was fueled by a 37 percent rise in U.S. sales. The profit compared with a loss of $1.4 billion a year earlier. Revenue rose to $28.1 billion from $24.4 billion. Ford said the improvement in Europe was explained primarily by higher volume, lower costs, and higher parts profit. First-quarter revenue in Europe was $7.7 billion, up from $5.8 billion a year ago. The first-quarter results prompted Ford to advance its forecast for becoming “solidly profitable” to this year instead of 2011. "Our plan is working, and the basic engine that drives our business results -- products, market share, revenue, and cost structure -- is performing stronger each quarter, even as the economy and vehicle demand remain relatively soft," CEO Alan Mulally said in a statement. Ford expects to build 625,000 vehicles in North America this quarter, 30,000 more than its previous guidance and 194,000 units above the year-earlier total. Ford expects its automotive structural costs to be "somewhat" higher in 2010 compared to last year as the carmaker boosts production to meet demand. The company still forecasts year-end sales in the U.S. to be between 11.5 million to 12.5 million units this year. In Europe, Ford has raised its guidance on full-year industry volume to 14 million to 15 million units. Ford's previous guidance was 13.5 million to 14.5 million. 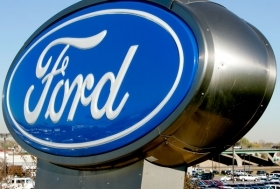 Ford expects its U.S. and European market shares to be equal to 2009. The change in industry volume forecasts reflects strong first-quarter sales, although Chief Finance Officer Lewis Booth says there still is uncertainty about the extent of payback from scrappage programs in Europe. Ford's automotive operations had a pre-tax operating profit of $1.2 billion, vs. a loss of $1.9 billion a year earlier. Ford ended March with $25.3 billion in automotive cash, down from $25.5 billion at the end of the fourth quarter. Booth attributed the negative cash flow to Ford depleting its year-end inventory and then having to build up new models for the current model year. "We will be solidly profitable in 2010," Booth said. "We will have a positive cash flow." Ford Motor Credit reported net income of $528 million, up from a loss of $13 million a year-earlier. Ford said the improvement stemmed from leased vehicles holding their value better, which yielded higher prices at auction. "Economic conditions are still uncertain and, as always, we will utilize the solid business practices and superior servicing that remain the foundations of our company," said Ford Credit CEO Mike Bannister in a statement. Ford was projected to earn $1.2 billion in the quarter, according to an average of three analysts' estimates compiled by Bloomberg. The automaker's first-quarter U.S. sales surge was more than twice the industrywide increase, and Ford had the smallest discounts among domestic automakers, according to researcher Autodata Corp. Buyers also chose costlier options, helping generate more revenue per car. Redesigned models such as the Taurus sedan helped boost U.S. market share to 17.4 percent through March from 14.7 percent a year earlier, the biggest jump since 1977, according to Ford. This year, dealers will get the new Fiesta and Focus small cars after Ford's reliance on trucks contributed to $30 billion in losses from 2006 through 2008 as fuel prices surged. The automaker last posted four straight quarterly profits from the third quarter of 2004 through the second quarter of 2005. Executive Chairman Bill Ford, 52, said shoppers are considering Ford models in part because the automaker avoided the government-backed bankruptcies that befell the predecessors of General Motors Co. and Chrysler Group. “But if they don't like what they see, they'll go elsewhere,” he said after a speech this month in Detroit. Also buoying Ford's share is a shift in some consumers' impressions after Toyota Motor Corp.'s recalls of more than 8.5 million vehicles worldwide, said Bernie McGinn, president of McGinn Investment Management of Alexandria, Virginia. Toyota's first-quarter U.S. vehicle sales rose 7.2 percent, half the industry's 16 percent advance. Pricing gains helped, too. Revenue from each vehicle sold rose $2,041 in 2009 on new models such as the Fusion hybrid and purchases of more-expensive features, according to Mulally. Ford expects to see “positive net pricing” again this year, Booth said in January. Mulally's brand-repair strategy was financed by $23 billion in borrowing after he joined the company. While those loans enabled Ford to avert a Chapter 11 filing, they also added to automotive debt that reached $34.3 billion at the end of 2009, up from $24.2 billion a year earlier. GM and Chrysler were cleansed of obligations in bankruptcy. GM reported paying off the last $4.7 billion in U.S. loans April 21, the same day Chrysler posted a first-quarter operating profit of $143 million. Ford can't risk complacency and arrogance as it tries to complete a turnaround, according to Bill Ford. First-quarter U.S. sales totaled 1.08 million in 2000. This year's tally was 441,708. For now, Ford reaps rewards for going it alone and not taking a government rescue, McGinn said. Of 16 analysts covering the shares, eight say buy, six advise holding and two recommend selling, according to data compiled by Bloomberg. In January 2009, one analyst had a buy rating while eight said hold and three said sell.